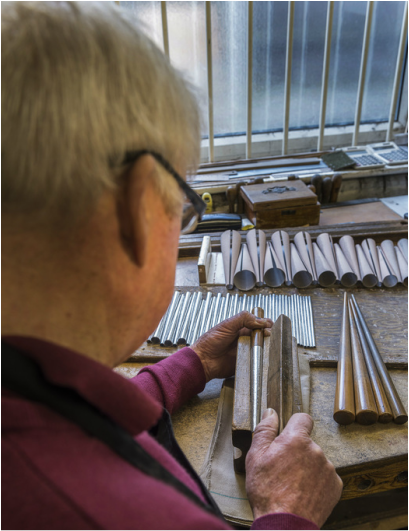 Steve Parker carries out a traditional organ pipe-making technique in our workshop: planing the metal by hand. Flue pipes, which include the diapason and flute families, produce sound through the air vibration. Wind under pressure enters the toe and is forced through a narrow gap – the windway – between languid and lower lip. It speeds across the mouth, past the upper lip, causing oscillations at a frequency determined by the pipe's length. 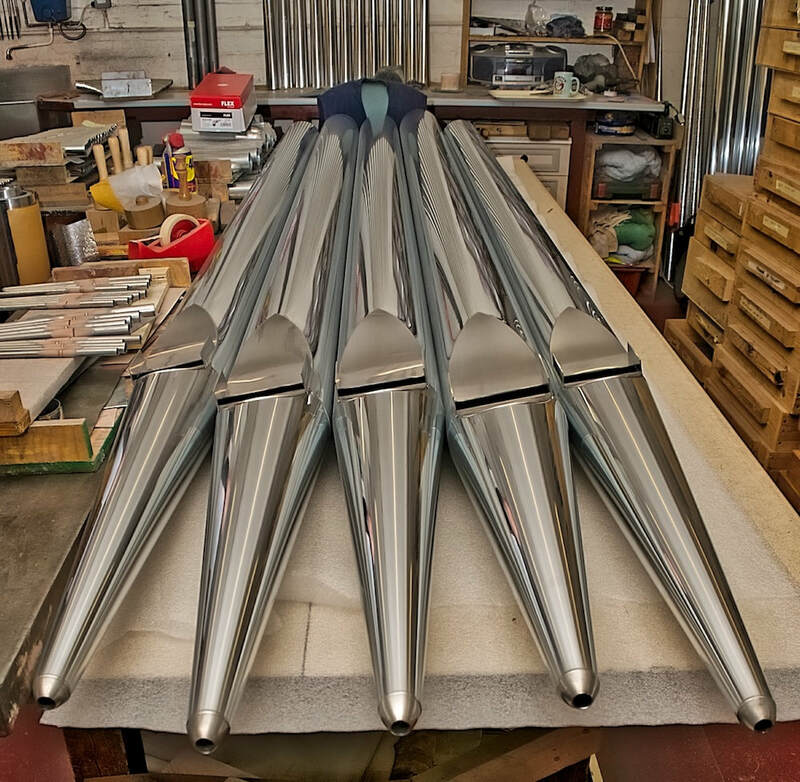 Flues may be made from metal or wood but at Shires we produce only metal organ pipes. There are two main parts to a flue: the foot and the resonator. The foot is usually conical but its length doesn't affect the pipe's pitch, so it can be varied according to the organ builder's wishes. Determining factors include the desired shape of the façade pipes, the height of the rackboard in which the pipes sit and the weight of the completed pipe. ​The resonator supports the oscillations of air generated at the mouth. Voicing, together with the length and volume of the resonator, determine the fundamental pitch of a flue pipe while the conical taper determines the overblown pitch. On metal pipes, a tuning sleeve or collar may be fixed at the top of the resonator and raised or lowered to vary the pitch. Between the foot and the resonator, the side of the pipe containing the mouth is flat. Flat pieces of metal, the 'ears', may be attached to the mouth sides for tuning purposes. 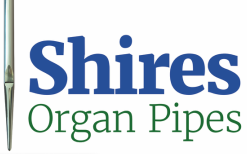 Flue pipes hand-made from the finest materials by our skilled team in Leeds are renowned for their meticulous construction and quality of tone. George Fowler makes a pipe for a mixture rank, right, while in the video, above, Terry Doyle solders pipe feet to the body.